Employers are implementing cell phone policies – private corporations, non-profits, government agencies, municipalities, educational institutions, mass transit – not only for their fleets and commercial drivers, but for all employees. 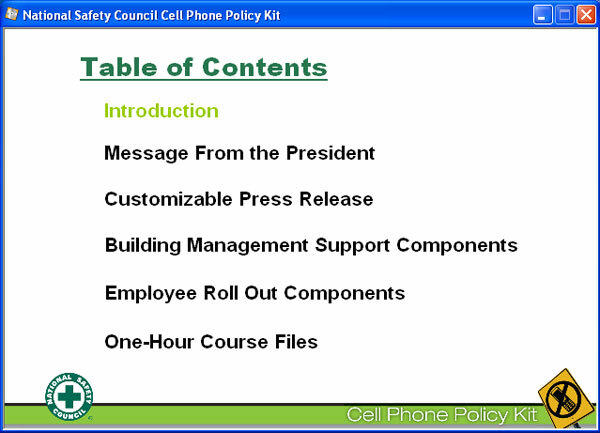 The National Safety Council's kit provides ready-to-use sample policies, a presentation and printable executive summary for senior management, a tip sheet to build employee buy-in, and many policy roll-out communications for employees: talking points, posters, voice mail greetings, FAQs, newsletter articles and more. For intensive education, see the 1-hour course with instructor and participant guides and PowerPoint presentation.